Candidates' Spouses: Use and Abuse It's awfully early to be talking about the people who are married to the people running for president. But with so many campaign issues surfacing ahead of schedule, Judith Giuliani, Jeri Kehn Thompson and Bill Clinton are making plenty of headlines. Jeri Kehn Thompson, wife of former Sen. Fred Thompson, has been an object of fascination for the tabloids — print and electronic — for her age (she is 40, Fred is 64) and her striking looks. 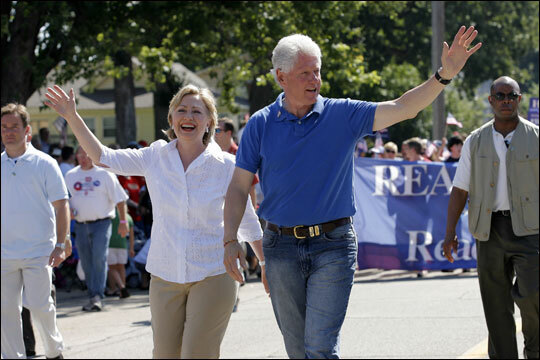 Sen. Hillary Clinton's husband, former President Bill Clinton, sometimes says he's hoping to be the "first laddie." A Vanity Fair profile of Judith Giuliani seemed to suggest that her ambition was the primary fuel for her husband's presidential campaign. It's awfully early to be talking about the people who are married to the people running for president. That topic usually does not get much public attention until the two major parties have settled on their nominees in the spring of a presidential election year. But every other aspect of the 2008 cycle seems to be on amphetamines, so why should spousal scrutiny be an exception? 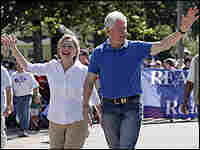 Hillary Clinton, of course, has the most famous marital conundrum in her husband, the former president — who sometimes says he's hoping to be the "first laddie." No one knows just what duties might fall to him should his wife win the White House. But for now, Bill is clearly Hillary's No. 1 political partner, a co-campaigner of unprecedented power. He inhabits the very heart of the Hillary Clinton campaign. Just this week, the former president was brought out to spin his wife's latest argument against Democratic rival Barack Obama. The candidate herself had been debating her fellow senator for a solid week on the issue of presidential summitry with nettlesome foreign leaders. It was time for her to disengage and declare victory, however dubious, in the spat. Her husband stepped in and did it for her deftly. But once again, the appearance of Bill was two-edged, triggering denigration of Hillary. Why did he have to fight her battles? And always the torpedo waiting in the water: How will she survive if her husband is caught straying again, this time in the midst of her campaign? Such questions are as much a staple of the campaign coverage as popularity polls. 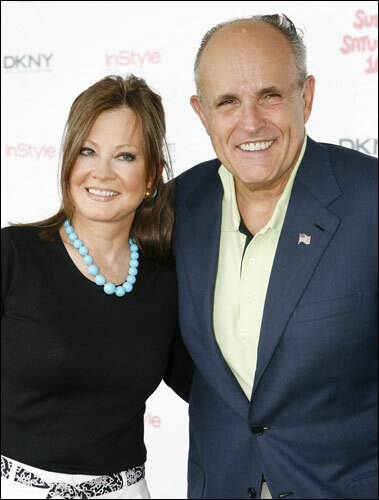 Salacious questions were also salient in the Vanity Fair profile of Judith Giuliani, the third wife of the Republican frontrunner Rudy Giuliani. The article noted that the couple won't discuss how they met, noting also that both were married to other people at the time (second spouses in each case). Vanity Fair also seemed preoccupied with Mrs. Giuliani's other offense against convention, the forthright ambition that drove her from small town Pennsylvania to Gracie Mansion. Would it be enough to get her all the way to the White House? Vanity Fair seemed to suggest it was the primary fuel of her husband's campaign. A similar accusation has been hurled at Jeri Kehn Thompson, whose husband Fred is hitting some bumps in the run-up to his official announcement of candidacy. Scarcely a story goes by on this topic without hinting that Mrs. Thompson's heavy involvement is a sore point among campaign staff. She also has been an object of fascination for the tabloids — print and electronic — for her age (she is 40, Fred is 64) and her striking looks. Suffice it to say she represents the greatest departure from the frumpy first lady stereotype since Jackie Kennedy, nearly half a century ago. Like Jackie, Jeri commands some media respect for landing one of Washington's most notoriously eligible bachelors. Tittering over Mrs. Thompson's appearance reached a crescendo a month ago and subsided. What returned her to the Internet headlines this week was the news that the Thompson exploratory committee had raised just $3.4 million in its first reporting period. This number was unacceptable because the world of campaign professionals had swallowed the Thompson camp's own projection of $5 million. This means these gimlet-eyed observers had really expected the former senator from Tennessee to raise far more than $5 million. Enthusiasts assumed the figure was a lowball estimate, so that the actual number would blow the pundits (and other campaigns) away. It didn't happen, and that was bad news that had to be blamed on someone. Anemic fundraising is not a disease to be taken lightly in presidential politics. It spawns all manner of questions about a given campaign. John McCain, the fallen GOP frontrunner, might have survived his issue woes and free-spending aides had he raised proper frontrunner money. When he failed to do so two quarters in a row, well, they started carting in the flowers for the funeral. Thompson is, after all, the man many Republicans believe is best able to defeat the Clintons in November 2008. Thompson is running second in most polls to Giuliani and prompts overeager comparisons to another actor-politician, Ronald Reagan. How is it that he managed to garner so little money in his initial month, when he and his crew had nothing more important to do? Obama has raised more than $50 million, Clinton more than $40 million. Giuliani and Mitt Romney have each raised more than $30 million. When is Fred going to get in the game? Thompson detractors will point to his lack of discipline or lack of focus. They will say he did not work the phones hard enough or attend enough fundraisers. Some will say he hurt himself by twice delaying his formal announcement, or that he never had the requisite commitment. But there are also plenty of people putting the blame on the wife. Jeri Kehn Thompson is no more the conventional political spouse than Bill Clinton is. She may have been a lit major in college, but she soon found her way into the working end of politics — at the Senate Republican Conference and the Republican National Committee. She has also been a media analyst at a high-powered Washington lobbying firm. Along the way, she also met Mr. Thompson, who had been elected to the Senate in 1994. Many believe Mrs. Thompson was as important to her husband's decision to run as Mrs. Giuliani was to hers. One thing is beyond dispute: Both women are now very close to the inner flame of their spouse's presidential ambition — just as Bill Clinton is to his.